The Puppet Company are a long established company specialising in the creation of puppets in all shapes and sizes including, finger puppets, glove puppets, full-body puppets and rod-arm puppets. 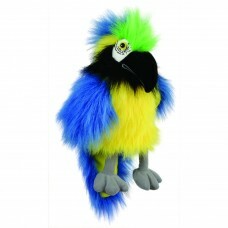 The blue and gold baby macaw hand puppet is vibrant in colour and therefore cannot be ignored. It is a replica of the Puppet Company's range of ever popular Large Birds. It comes with a full working mouth plus a loud squawk to ensure it receives the full attention of its audience. It is suitable for children to use or for small adult hands to join in the fun. It is suitable for children aged 3 years and over.